Callnote 5 is out now. 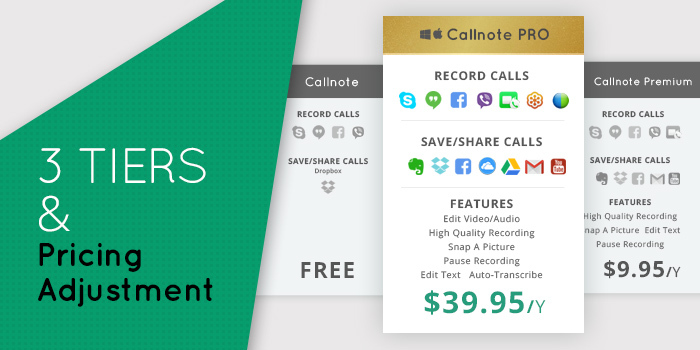 And we’re adjusting our subscription rates to more accurately reflect the value users get from Callnote. This will also help us to offer new engagement features coming your way soon. Attention users registered and subscribed before Callnote 5 release (11/13/2017). The new rates will not affect your current Premium yearly plan, but we want to advance notice our users that your subscription will transition to the free version of Callnote after one year. So, after one year, you will have an option to upgrade to a paid version (Premium or Pro) or it will automatically transition to the free/regular version of Callnote. Please update your version by entering your email in the Already registered section and selecting Download then, and continue to enjoy all of your Callnote Premium features for free! Please Sign Out/Sign In in order update to take effect. Our latest version of Callnote is loaded with cool new features. If you choose not to update to version 5 you can continue using your older version of Callnote. Please note that we do not offer tech support to Callnote versions older than 5. The new rates will not affect your current Pro yearly plan, but we want to advance notice our users that your subscription will transition to Callnote Premium after the end of your billing cycle. So, after the end of the billing cycle, you will have an option to upgrade to a paid Pro version or your license will automatically transition to Callnote Premium. Please update your version to the most current by entering your email in the Already registered field and selecting Download then, and continue to enjoy all of your Callnote Pro features for free! Please Sign Out/Sign In in order update to take effect. Our latest version of Callnote is loaded with cool new features. If you choose not to update to version 5 you can continue using your older version of Callnote at the original pricing. Please note that we do not offer tech support to Callnote versions older than 5. Have any questions or concerns? Just email us at support@callnote.net and we’ll get back to you quickly.